Outstanding 2 story mountain view home with downstairs bedroom/den & full bath. Many upgrades throughout this turnkey condition home. Modern chefs kitchen with ceramic counters, ceramic tile floor, dishwasher, built-in microwave, built-in gas range, double ovens, breakfast bar and separate dining area. Ceramic tile entry to living room with vaulted ceiling. Lot's of light from many windows too! Formal dining room and separate family room with red brick faced fireplace. Master bedroom suite has full bath with separate shower & tub, walk-in closet and covered deck with ceiling fan and gorgeous mountain view to enjoy with your morning coffee. The backyard is fully finished with vinyl side fences and wrought iron with a covered patio ready for your BBQs! Spacious 3 car garage with lots of storage.Ready for RV expansion parking. Keep your electric bill low with a Photo-voltaic Solar Electricity generating system to keep your bills and carbon footprint low. Low taxes and no HOA. 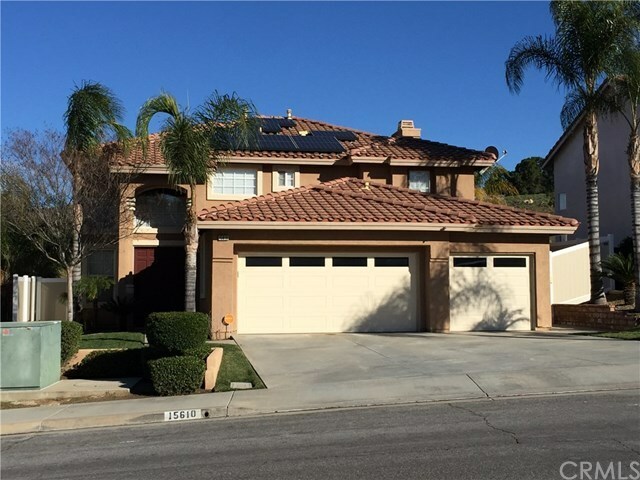 Close to Kaiser Permanente hospital and Riverside County medical center hospital, public transportation close by too and near to shopping and schools. This home is a gem and won't last long!